Homeschool Sites Good Sites for Homeschool Kids and Teachers! Our Holiday Activities and Games page has plenty of crafts, songs, play, links, and online games for holidays. 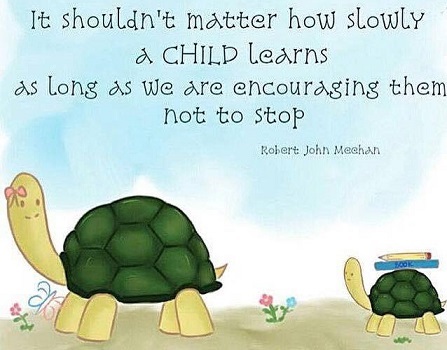 Check out our Early Learning/Early Childhood page! Click here for a shortcut down the page to our new international section! Scotland, and the UK, so far. Americans, you are definitely not alone. 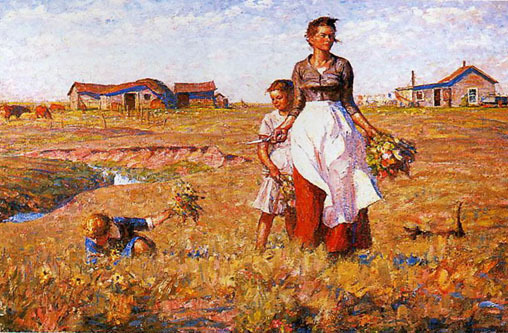 "The Prairie is My Garden" by Harvey Dunn. You may order a copy from the South Dakota Art Museum by clicking on the picture. There's quite a bit of home school (or "homeschool") material on the web. For more info, Google "home school". kid sites for you to check out. Just added! Homeschooling for English speaking countries outside the USA! Two Awesome Visuals on ADHD for Teachers from Educational Technology and Mobile Learning. This page briefly goes over three types of ADHD, then goes straight to the "visuals", or infographics. "To help teachers learn more about ADHD, here are two awesome infographics I want you to have a look at." Rather than discuss them here, we'll let you take a minute to look them over. If you can use them, use them. language arts, vocabulary and thinking skills." We found these to be loud, fast, and good. 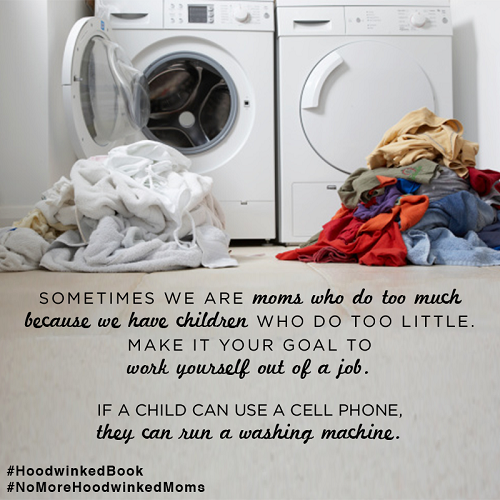 10 Cleaning Skills Your Kids Should Learn from About.com - Housekeeping. We could only find six of them on the page. etc, before they grow up and (hopefully) move out. 10 LESSONS I WANT MY KIDS TO LEARN AND BOOKS THAT HELP TEACH THEM from No Time for Flash Cards. share with family members. I love hanging my girls' fall art work on our walls to show our family friends their creativity. Check out some of the fun turkey crafts below for some inspiration this Thanksgiving! but some of them may help yours. to code!" Names, links, and information about 19 online places for learners to learn coding for free! Explorer and a devoted homeschooling mom." creating some colorful masterpieces. These would make the perfect gifts for grandparents too!" These are sooo cute!! has plenty of other good things as well. disabled students, are always looking for new tools to help the kids meet their potential and work through their disability. are sorted into Helps, Fundamentals, Reading, Writing, and Spelling. This article is posted at Educator Technology and Mobile Learning, where there are a lot more articles like this one. to do? Want new things that will encourage safe exploration while developing motor skills and problem skills, too? free educational resources for K-12 students (kindergarten through high school students) and their parents and teachers. and computing. This newly-released list is a work in progress. Please tell us if we’re missing something good." From Open Culture. in the rich veins of this gold mine! You should go there and slowly scroll through this massive wall! Nålebinding ("single needle knitting") is an early form of knitting. Viking crafters were very big on this style. This child's sock is from ancient Egypt, in Coptic style; wonderful how it has kept its colors! 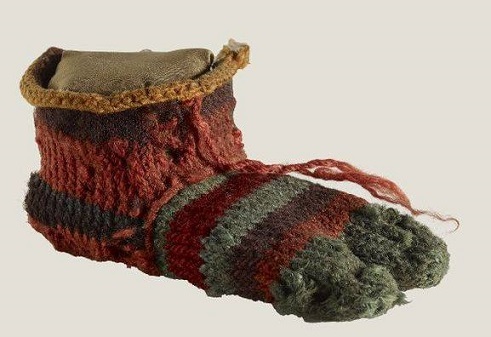 Coptic Christians of Roman Egypt liked to make a separate pouch for the big toe. Japanese work boots still have these today. great elementary holiday activities here!" This site has everything, and it talks! 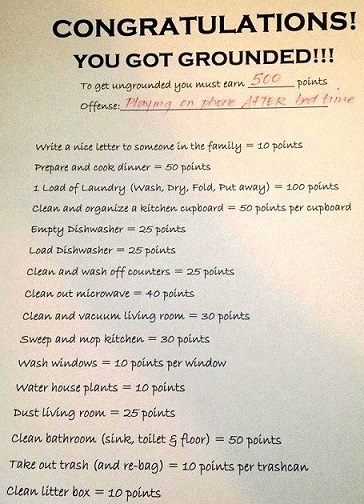 selection opens in a new window, so make sure your kids close it out at the end of each game. Use these free pinted sheets to practice this trick. "For example, a, d, g, and q are all formed by starting with the letter c.
My kids knew how to form a c, but would start in all kinds of places to write the other letters. writing lines to scaffold young writers. This is a fine example of adaptive and creative instruction! Activity Village Here's a site from the UK that will help out parents and teachers. educational resources, kids crafts, puzzles, printables, Sudoku for kids and much, much more ! busy!" Tons of coloring pages! The site has a popup to start, x it out or just subscribe. involved in this. This is a pretty useful site for grownups. for when you need to do that. Well known and used by kids and teachers for years. each heading. Look for ideas here! math, science, social studies), articles, literacy coloring pages and more." '80s and '90s here. Seem to remember playing them on TI99s and Apples, and they are still good for today! It's worth your time to look these over. resources for kids! There should be something in here for whatever you have in mind. Atlanta Homeschool on Pinterest K-12 ideas and links, by subject and by grade. Lots of other ed links and activities, too. probably improved - and they keep the old version for a while, too. Keep looking. as the health of friends, classmates, and others in the community." Chicken pox (NOT harmless), diptheria, measles, mumps, polio, and whooping cough are making a comeback. up through teenagers and lots of other vital information. about 1880 to 1922. There is some pretty good stuff in here, all online. (which is also in here). Thousands of stories and hundreds of books are included. A real treasury! Warning: Please remember, the world 100 years ago was quite different. Better in some ways, worse in others. Some people would now label some of these works as racist, violent, too religious, etc. It is what it is. You are the adult. Read them first. If you don't like something you see, don't share it with your kids. Period. It's still a wonderful collection of "kid lit" and we are happy to include it here. Basic Venn Diagrams Here's a quick introduction and suggestions for lessons for lower grades. Venn diagrams are a quick graphic way to teach basic elements of logic. A good grounding in principles of logic is essential to developing critical thinking skills. and the literature is both good and traditional. maps, crafts, timelines, and more (all in chronological order) for supplementing hands-on history!" Thanks to Carol Henderson for the email about the site! Brain Workshop "What if a simple mental exercise could improve your memory and intelligence? task called Dual N-Back may actually improve working memory (short term memory) and fluid intelligence. suggests that the dual n-back task also enhances focus and attention and may help improve the symptoms of ADHD/ADD. The game involves remembering a sequence of spoken letters and a sequence of positions of a square at the same time. Brain Workshop is a free open-source version of the Dual N-Back mental exercise. Easy download, easy install. toys a new lease on life and a more down to earth, natural looking style." - Sonia Singh, artist and mum. Tree Change Dolls, has even more dolls. Nobody thought this would go viral but did! It's tapped into a reservoir of concern. Bug and Insect Crafts for Kids "How to Make Bug and Insect Crafts to use in Your Home School and Preschool. some spiders, and paper roly-polys (aka sowbugs, woodlouse). Everything's illustrated, with written instructions and parts lists, like a cookbook's recipes! activities/lesson plans to cover health, mathematics, and physics. All activities are PDF file downloads. There is quite a lot of good "stuff" in here! Here is a chance to get your kids up and moving outdoors. Take along a clipboard, stop watch, calculator, etc. and have fun! Thanks to Shelly Flack for this site suggestion. 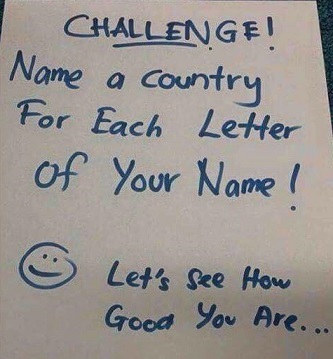 Older kids could try this using names of states, provinces, counties, countries, rivers, lakes, oceans, you name it! lighthouses, math, mammals, and marbles, to name some! and find it suits them well." They offer a free trial period. Answers to questions and help with textbook answers are excellent. There you have it! Thanks to Heather at Chegg Homework Help for her emails. even stress management for kids. IMO for toddlers through primary grades. and Young Adults." Lots of websites, discussion boards, book awards, best sellers, teaching ideas. Nice to look at and well organized. Children's Books Forever! "Free children's books that have become ...favorites around the world. You can use them on Smartboard, PowerPoint, or overhead projectors." Prometheans, too, we might add. All are in pdf format so can download and save them. books online! Oodles of stories indexed by reading level. 5 - 8 year olds and the games are excellent! Free to you (GNU-GPL licensed) and ready to download and install. Downloads in the middle of the page. Choose your "platform of choice" - Windows users click win.png. committed to providing products and services that promote healthy decision making and healthy, active lifestyles. a life- time; therefore we focus primarily on young children and the adults who make decisions on their behalf." All kinds of good things and activities for children and parents. We love their music and videos! find resources in your interest area, and then use them to create lesson plans or at-home activities." Coloring for kids Free, printable coloring book pages! You can choose from 1000's of printable coloring pages. can find their favorite cartoons . More than 10,000 printable coloring sheets. in 15-30 minutes... Use these 50+ activities in the computer lab." The ones we played are good! Tabbed by subject. writing activities. I offer writing contests for students, and am adding a new section with Daily Writing Prompts. The site also includes independent study project ideas, online vocabulary quizzes, and a math problem of the week. existing literacy and math programs, or use them to facilitate book clubs or enrichment activities." Yes, all that and more is in here! What a treasure for teachers! formatted in pdf file format. Perfect for home childcare providers, and parents teaching children basic concepts at home." telling time worksheets, dot to dot, holiday pages, lots more! Good site layout and graphic design, too. But wait, there's more! 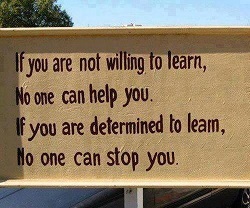 for the classroom. Color individual pages or download a bunch to make your own coloring book. Cool Coloring Pages... Coloring pages for Your children !!!" The sites from Poland but it's all in English. So thank you, Mr. Wiktor Chmur, for emailing us about your site. The Craft Train "Crafty Ideas for Kids and Parents." Bunches of crafts (200?) organized by categories. It's all things kids can make. Toilet Roll Bunnies (cute! ), egg carton jewelry boxes, tinfoil tiaras, and hundreds more ideas, all with parts lists and photos of steps. about the holiday. EL's usual excellent work here. 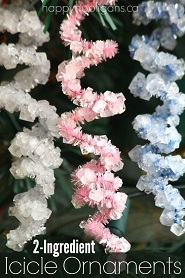 Crystallized Icicle Ornaments with Borax - Make shimmering crystallized icicle ornaments with pipe cleaners, Borax and water! It's a classic science experiment and a Christmas craft all in one! 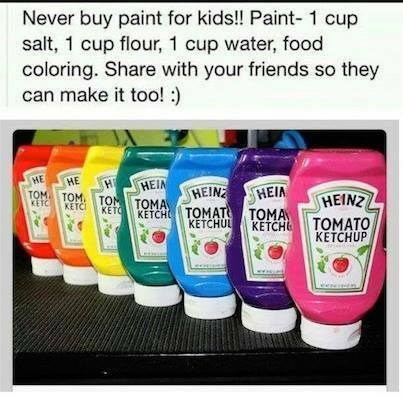 From Happy Hooligans, "Crafts and Activities for Toddlers and Preschoolers". Curriki The Global Education & Learning Community. "At Curriki, the sole mission is to educate. as they can." You truly owe it to yourself to investigate this site. Cursive Monsters by funkylindsay on Flickr. Pinned by Alina Hensley via PediaStaff. Your kids write their name in cursive and color in the gaps. Presto - monsters! Cyberkidz "is an educational platform for boys and girls in the age of 4 till 12 years. By playing the educational games, children will practise subjects they learn in elementary school (PK-5)." in every curriculum category, with new ones being added. This is an excellent site from the Netherlands. sentence structure, better parsing, better writing, and better public speaking. This page contains a decent Power Point about diagramming. Science Fair Central, lots more! You need to visit this site if you haven't already. Dolch Word Lists from Jan Brett. "11 full-sized, printable lists with Jan Brett artwork." Great Jan Brett art, 20 words per page. Drawing for Children is a great, very cool, free download (Windows only) from the Netherlands. from Windows Paint. 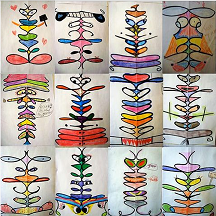 "Drawing for Childen is a free drawing program for children with many nice options. The best way to learn to use it is simply to use it. There is a document describing the use of the program. For more information, see the readme file." many articles for parents, and many resources. 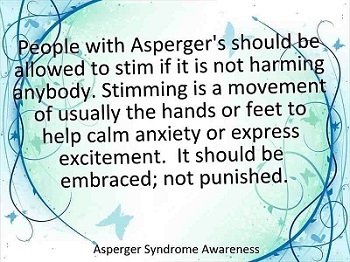 and is being updated continually and improved based on input from other dyslexic users. For attribution, a simple mention of the URL, and linkback where applicable is sufficient." (We did that.) OpenDyslexic is constantly evolving based on feedback from users and educators. heavier bottom. This font is open-source with volunteer developers. your time. There is also a user manual for downloading. and proven, OpenDyslexic keeps improving and welcomes skilled volunteer help. It is a matter of preference which one you use. to read better. Example (only): (Done entirely with Word.) Play with these fonts and ideas. Good luck. These fun and entertaining sheets are well illustrated and are grouped by subject. They also have printable Literacy Lesson Plans! This site is updated at least monthly. courseware. Parents and educators have a pre-screened source of articles, research, and related links. language arts, science, computer, health & life skills (lots), and learning English. Eagles Internet Resources from the Grain Valley School District, Grain Valley, Missouri. (academics only - there are more). Be aware that each is broken out into many subtopics. Educational-freeware Check this site out!! "Welcome to www.educational-freeware.com! This site is dedicated to listings, descriptions and reviews of the best free educational software for kids and adults. Some of the software is web based (see the online section), and some is Windows software that you can download (see the downloadable section). Many of the software titles are multilingual. In order to see what titles run in your language, you can list the software by language." Edu Gain "Learn Smart" Here's an international site (free registration) that emphasizes mathematics. Their essay on opening children's minds to mathematics is a good read on its own. and printables drills). Not a site for slackers, kids will have to work and think here. Thanks, Anamika Sinha, for the email about Edu Gain! Enchanted Learning (The ZOOM sites people.) Amazing site! So much to see and do, so much to print off! 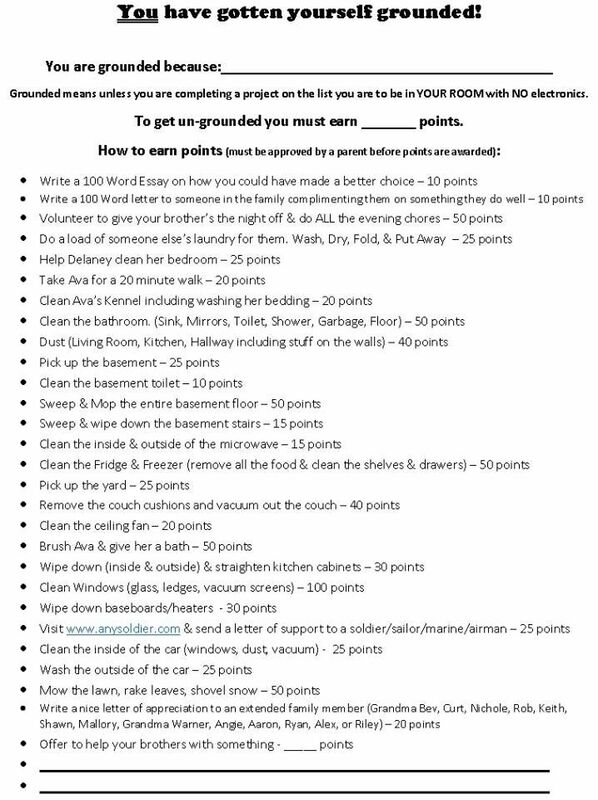 and its printable activities. Subscribers get tons of even more goodies to use. who have contributed to scientific and social development, economic security and prosperity, and the creative arts. geography, history, people, finance, education, economy, immigrating, jobs, etc. Kudos to Vera Johnes at CanadaFaq, for the email telling us about this fine web site. Figure This! You should really try this site out! En ingles y tambien en el espanol. "Welcome to the Figure This! Web site! Helping families enjoy mathematics outside school through a series of fun and engaging, high-quality challenges. Figure This! can do at home with their families." say to follow, engaging site with 80 printable math activities for you to try. Uses .pdf files. the history of money, and more! Flash Cards free download game for Windows only. This really is a great game. and a count of correct/incorrect answers is displayed. This program is freeware. Enjoy." Free Mathematics Books 258 math books available online for reading or downloading. format...The list is updated almost on a daily basis.."
with a dictionary while another plays. 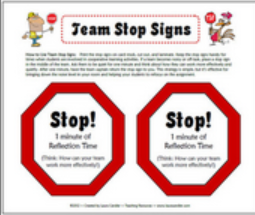 FREE Team Stop Signs from Laura Candler, as posted in TeachersPayTeachers®. created years ago help manage the noise level during cooperative learning activities. assignment. They can also be used when doing math and literacy centers." Free Worksheets for Kids from K-5 Learning. This is a commercial site with a good reputation. They offer quite a bit of free material. "Our website has free resources for preschool through grade 5 kids. Mastering these worksheets would give students a solid foundation to build on. Thanks to Joy for her email. facts and more facts, printables, stories, myths, more fun than a barrel of bullfrogs! Teachers' Corner has suggestions, links, and lesson plan outlines for class projects! funathomewithkids.com is a Pinterest page with sensory based activities for toddlers and preschool. little folks could have so much fun discovering so much! experiential, amusement, reading, mathematics, puzzles,telling time, money, and strategy games like Macala. 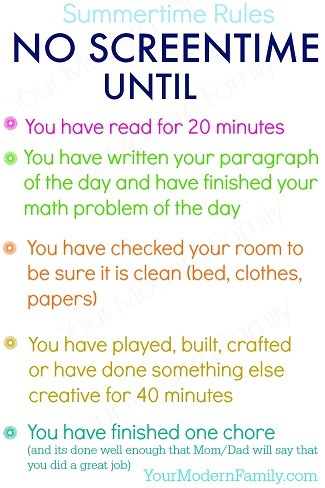 Some of these will really make a child think! Another SourceForge find. Gambassa "Tools for Modernized Education. Designed to Work Together™" FREE for educators and students! created by others." The rest of their pitch is on their first page. Here's an example of a student made presentation. This has possibilities for teachers. Games for the Brain. "Play neverending quiz, memory & brain games to train your thinking." Around 40 games, some old, some newer, and the site is available in many languages. Easy to play, good for your mind. George Washington Quotes from Notable Quotes. Nine pages of quotes, around 25 to a page. Also has a good biography and a trivia quiz. Great for American history among other things. The man wrote quite well and knew his grammar.
. Defining, detecting, strategies, process, lots more. A basic "how to" with resources in depth! 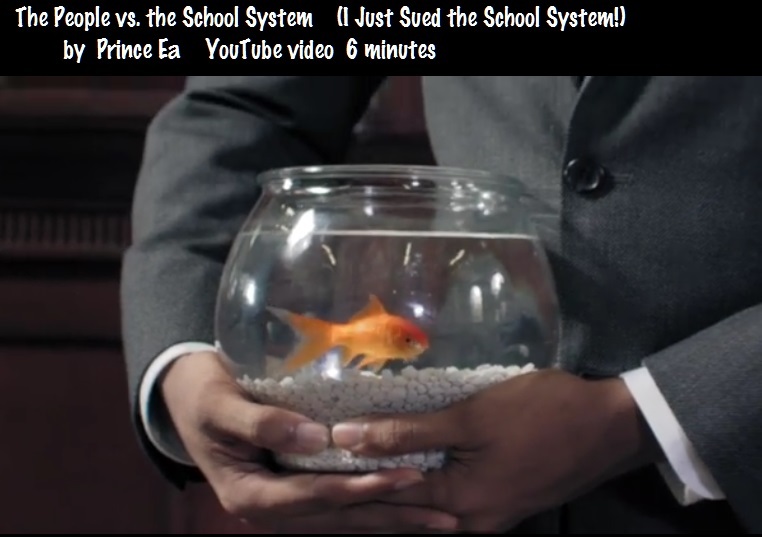 Goldfish Climbing Trees (I Sued the School System) or, The People vs. the School System. 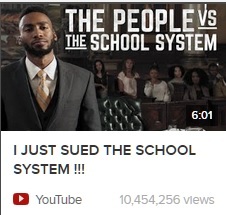 Six-minute video by Prince Ea discusses the failure of our traditional classroom education system. This video speaks for itself. It's a springboard for discussion. Watch it and think about it. economic education). If you like this, she has dozens? scores? hundreds? of other good things to try! the page under More Fun & Learning. similar sites. Very, very nice. Check out the Skeleton Dance! Hillbilly Housewife has weekly menus, inexpensive recipes, planners, and advice for people on a budget. "The focus here is on low-cost, home-cooking from scratch. The recipes are all tested in a real kitchen. The ingredients are affordable and readily available in most areas. " This is timeless advice for young parents on a budget, and it's free. all sorts of activities, ideas, and resources for gifted kids, parents, and teachers. As we all know, public schools always cut gifted funding first, so a site like this one can help a lot. They've tried to post something for every gifted kid, so there's a huge variety here. Homeschool.com "Your virtual home school" has links to many home school resources. ideas for teaching different parts of the elementary curriculum, and things just for homeschooling moms. Homeschool Skedtrack Best Sites "Submit, comment, or vote on your favorite Educational Site!" Look at all submitted sites at once or use the menu bar along the top of the page to look by subject area. They even listed Good Sites for Kids at least once! This looks like an excellent clearinghouse for homeschoolers. Homeschooling in Canada Ideas "Homeschooling Ideas & Resources from Canadian Homeschoolers! 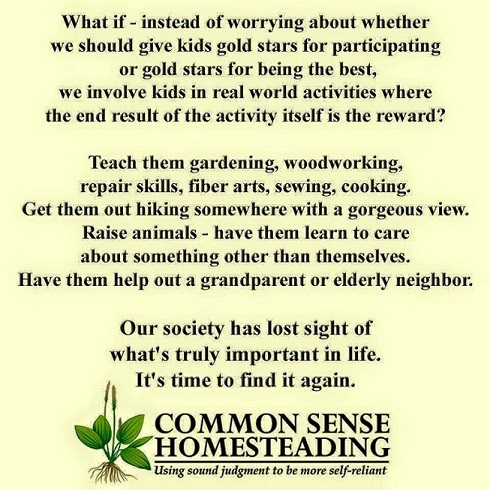 If you'd like to join, please send an email to thecanadianhomeschooler@gmail.com with your Pinterest URL. Please share any homeschooling inspiration, resources, curriculum ideas, support, printables, etc." A wide variety of entries for homeschoolers and schoolers, too. in different areas of the world. Here's a veritable trove of Homeschool information and support for homeschoolers outside the USA! There are sites here from Australia, Canada, New Zealand, and the UK. Use as necessary. Happy homeschooling! curricula, et c. It's a good sized site, too. and support groups for every state and nationwide. packaged homeschool curriculum that lacked any uniquely Canadian material. we measure in metric. I hate teaching words without the special extra 'u'." on the home page. She can be contacted via her site. This level of effort deserves recognition. have links to other homeschool sites and blogs, and they have THE Canadian homeschool store. level." Look through the Homeschooling in NZ menu selection, it is a very comprehensive guide. lists of email groups to join and generally find out about homeschooling in New Zealand." This compact, very organized site has valuable links to other NZ homeschool groups and sites. Canterbury Home Educators Is a good local homeschool site for Canterbury, NZ. The Home Educators Network Supports homeschooling in the Waikato District, NZ. Home Education Association, Scotland’s national home education support charity. their children outside the classroom, and those who just want to know more about how home education works. from Schoolhouse." Their deceptively small home page is actually evidence of good site arrangement. information and advice on all related subjects. Education Otherwise is the most well known UK Home Educator (HE) site. downloadable fact sheets covering many aspects of HE; and links to local HE groups across the UK." group starts up there, or when a group notices they're not entered yet. A real fountain of information. and a link to Scotland Homeschooling (with its own list of good links). Unfortunately all the FAQ government links are 404'd or this blurb would be larger. 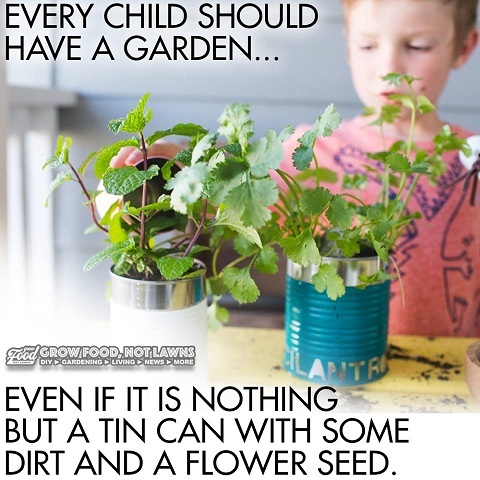 and fun kid science activities make for a dependable resource for home science teaching. HOT X: Algebra Exposed! Danica McKellar is back! This time she explains algebra to girls. down the math. Teen girls and co-eds use this book and it really helps! discusses 10 free or inexpensive programs that will introduce kids to coding by letting them code. Scratch is on this list (hurray)! We've used Scratch with kids and they liked to play with it. Fun and colorful, Scratch is an MIT effort. bottom of the article, too. How to Teach Your Child to Wash Dishes from WikiHow. 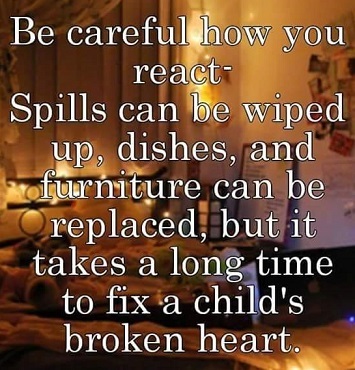 "Teaching your child to wash dishes can have many benefits. Step-by-step illustrations show you the way. We would add, don't get the water so hot a child can't put their hands in it. Also, the rinsing off is where you use the hottest water if you are not using a dishwasher. I Will Not Let An Exam Result Decide My Fate A Spoken Word video from Suli Breaks, British recording artist. Over half a million people worldwide have viewed this video. Looks like maybe half of them left comments! 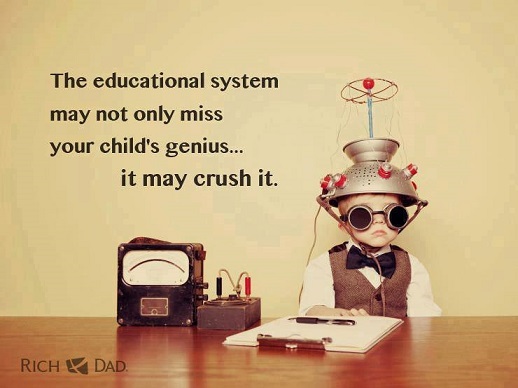 A protest against standardized, one-size-fits-all education systems. It's a pretty gripping video. your dream instead of being a wage slave. Don't want to put any more words in his mouth, out of respect. GSFK agrees with the plug: You Have To Watch This!! Choose your own POV and discuss this with other viewers. "Fewer than 3 in 10 graduates in science, technology, engineering, and mathematics are women. 2-minute video. Watch and learn." OK, yes it's an ad for educational toys, and an internet hit. girls who grow up to be engineers, mathematicians, scientists, or technologists - then it's surely worth it. information". Says it is one of the largest and most visited home school sites. Click on Contents to begin. words sound in the head, mouth, and ear, and demonstrate the use of parts of speech! in here is no longer covered well (or at all) in many educational environments. We should have posted this site a long time ago. A big THANK YOU to Josie Whitehead, the teacher who created the site and most of the poems! Jumpstart is a familar name with subscription games and free goodies, too. A good sized free pdf worksheet section and more besides. Mostly for the younger set. all demographics in the education system- parents, Students, teachers, Schools, district officials, etc. We are not just another website, but the website for education." handwriting practice. Lots of articles on everything from abstract nouns to finding a good reading program. Book reviews, games and activities to try, and reading topics. Teachers and parents will find it worthwhile to explore this site. sites' game, activities, worksheets, curriculum, resources list, and lesson plans. as an open source project--allowing the Khan Academy to become the free classroom for the World." Organic Chem, Cosmology, Astronomy; History; Finance (BIG section! ); Test Prep: SAT, GMAT, CAHSEE, IIT JEE. The videos are wonderful! This is amazing and FREE! 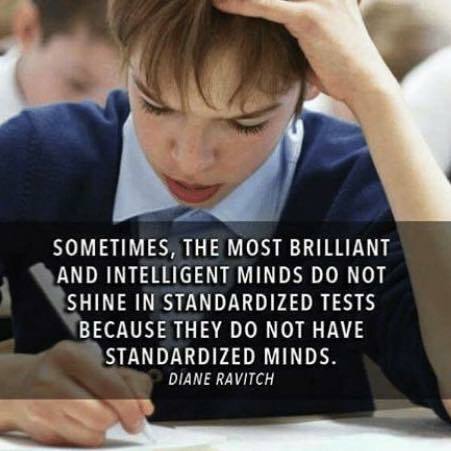 a unique, multi-step program to create empowered learners, not simply good students." Reference Library. From there they can go to grade appropriate online lessons. This is an excellent resource. child's ingenuity, though - watch your little ones on the internet. Thanks to Alice Cherry for the email. by teachers, parents, and experts from various fields to provide free learning opportunities for children all around the world." KidsOLR Kids Online Resources has lots of online lessons covering various parts of the K-12 curriculum. Their Telling Time activity is already in our Math and Telling Time section. Way too extensive to cover it all here - go check it out. or Brothers Grimm, online games and puzzles." Very colorful and kid friendly, with a good selection of printables. Thanks, Thea, for the email about your site! Kids Movies links with critiques and schedules (UK). Someone worked long and hard to bring this to fruition. places such as Starfall and other fabulous destinations. kid's early education or home schooling? Want to teach them new words, animals, numbers, shapes, and more? as audio flashcards, clickable pictures, and learning games." motor skill practice, pretending. A charming page with plenty of little treasures. of crafty things with these materials. with written and spoken names in several languages. Words are pronounced by volunteer native speakers. the site is free to use but they do ask for donations. Uses QuickTime. to publishing fiction, nonfiction, poetry, book reviews and artwork by children ages 6-12." This looks pretty good. A place where young artists and writers can show off their work! 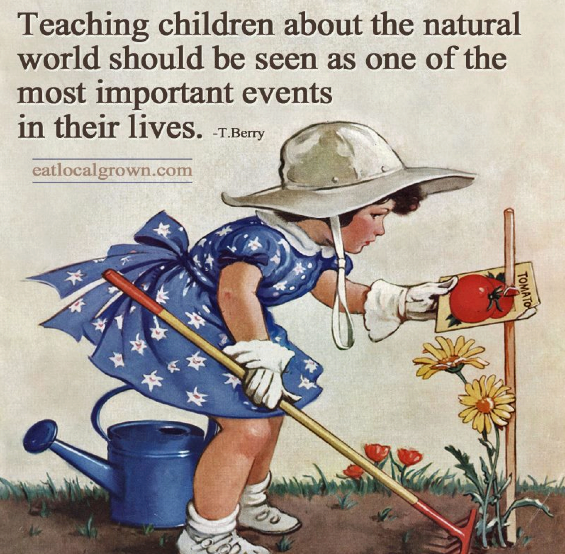 Leaves Nature Math Activity for Preschool "Children are naturally curious about the world around them. hold the attention of young children. Using leaves in the fall or spring is a perfect example!" 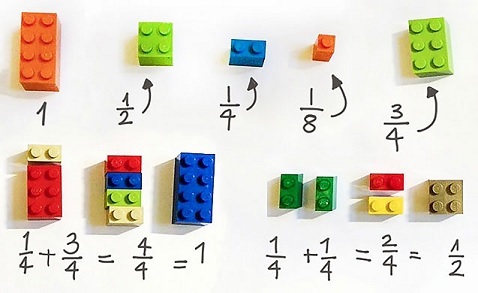 easily procured manipulatives to teach basic concepts to little ones. educational games that help build skills in math, language, science, social studies, and more? You've come to the right place!" Also we love their site layout. Learning Planet This is a subscription site, but it has a number of excellent free online ed games. and Kindergarten. The Students page menu is laid out for pre-K and K, 2nd - 4th, and 6th and up grades. Lessons In Electric Circuits "A free series of textbooks on the subjects of electricity and electronics." ends with explanations of capacitors and inductors. It's free, it's good, and it's on the web. LessonSnips "Welcome to LessonSnips! Free teaching lessons, lesson plans, worksheets, and more... "
are pdf files for easy saving and use. The lessons we looked at are reasonably short but comprehensive. 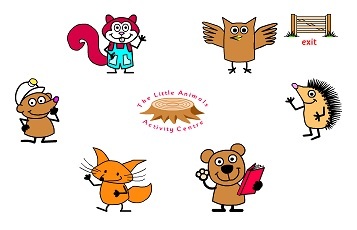 The Little Animals Activity Centre BBC have archived this web page and it's no longer updated. Still good, though! games (1:1 correspondence/memory drills). Storybear reads three interactive stories aloud (already in Readalouds). Puzzlesnuff has puzzles and games. Count Hoot counts and plays numeracy games. 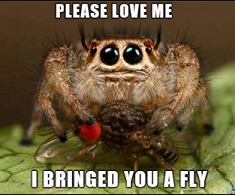 Really a loveable sweet site. video player. Each concept has 6 - 8 games and videos along the bottom of the screen, for kids to check out. Nicely arranged and does a good job of covering the very basic introductions to these concepts and ideas. Loving2Learn "Run off 100's of Books, Watch 100's of Educational Videos, and Play 100's of FUN Games!" you can find all sorts of good things here. Check it out! their dreams." Less than 1% of high school girls express interest in majoring in computer science. see it as a way to have fun and achieve their dreams," said Megan Smith, vice president, Google. GSFK thinks this is a good idea. online. It looks well worth trying in classrooms. with lesson plan ideas. Learn to write good apps and maybe get rich! Alice, MVB, C++, Python, and App Inventor are covered and various opinions expressed about each. some outside activities, some crafts and projects, and more. Worth looking at, for sure. Math Calculators! Here are 30 math calculators, each one calculates something different. time zones, binary, more, more, more! who grew up and earned a Bachelors in Mathematics. For Middle School girls (ages 11 to 14). Common Factors was rewarding. As any teacher knows, seeing students light up when they "get it"
can make your day! This is a non-compensated endorsement. Addition, Subtraction, Multplication, and Division. 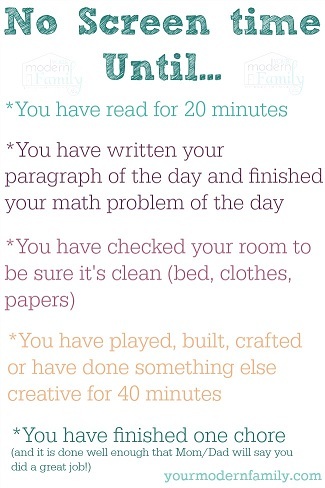 All WHILE PLAYING GAMES....who knew?" Math Worksheet Center "What is Math Worksheet Center? A huge K-12 math worksheets resource! lessons, homework, and quizzes. We also offer over 130 free math teaching and learning articles." These are on their Mathtips page. This looks like an excellent site. You will have to subscribe for a nominal fee to get the most of what they offer. Grandma of 4, and Tired"
in this clip. Someday, someone will get an advanced degree in Linguistics analyzing these clapping songs. Mixing in Math An after school math activity site for parents, teachers, and caregivers. 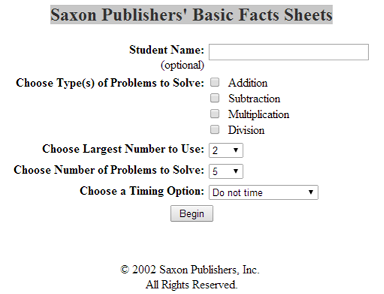 Designed to be used with any school math curriculum and complement homework. by subject and grade. We've mainly been using her Oceans links thus far. A nice collection of links to "good sites." comprehensive platform for kids in India." That would go for kids worldwide, too! Excellent site throughout. and printables, covering maths, English, science, history, geography, general knowledge, and a lot more. - and lots of fairy tales from India! there is a fee. Plenty of links to other Montessori-inspired and homeschool sites, too. Center's NATIONAL CHILDREN'S LITERACY INFORMATION project - a national children's literacy initiative. 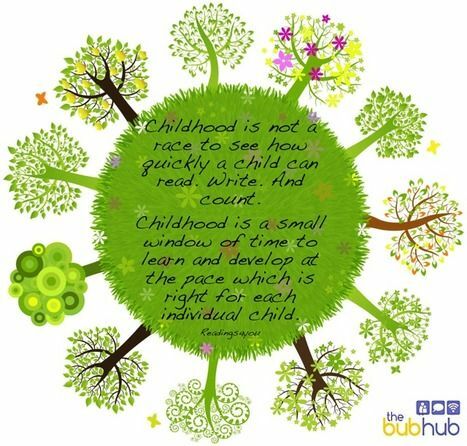 The Soho Center is committed to promoting children's literacy in child care settings and home settings. Jeanna Beker, Director, The Soho Center for emailing us about The Soho Center and its excellent literacy site! teaching children what to watch out for online with fun, interactive games and activities. encourage them to get out or do something ELSE first and see where THAT takes them?" They suggest this for summer or no-school days. subscribe for an annual fee and get lots more worksheets. Offered as a service by us with no endorsement implied. old MECC Apple games of the 1980s. Free software for you to download and install, or play online. puzzles of the US, Europe, Africa, Asia, and many more. 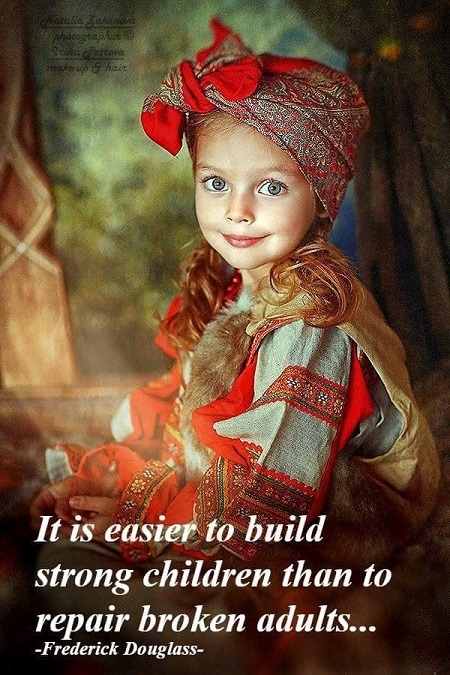 You can build your own castle and coat of arms—free downloads." Paragraph Writing in First Grade and Second Grade from The Brown Bag Teacher blog. This starts with tips for teaching paragraph structure that 2nd semester first graders can understand. First Grade Data and Graphing. An eight minute video on teaching paragraph structure is included. looks like a little homemade site for kids but it's HUGE inside! This site is set up with a model railroad theme. 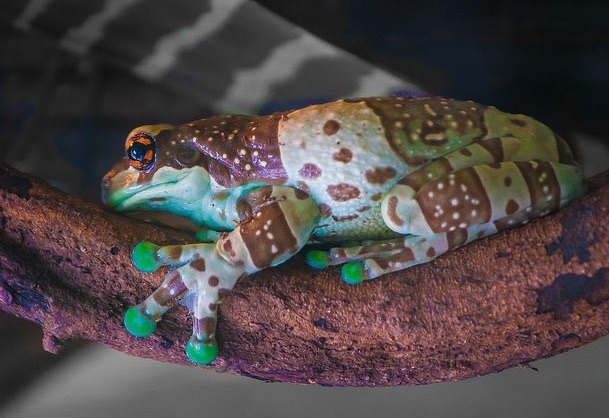 education topics, from ABC's to Zoo! Each Topic has links to that subject area, sometimes dozens of links. Not only PowerPoints (lots of them) but games and links to "good sites." Greta's Games has mostly academic games organized by subject. Often a dozen or more links per subject. Hannah's Homework Help Station has PowerPoints about doing research, and links to various research sites. You could spend a week looking in here! Anything you need for K-8, and some for higher schooling as well. section, read folktales, poems, and stories, investigate science, do fun mathematics! Some sections are in Hindi, for Hindi-speaking NRI kids who want to remain bilingual. There's something in here for everybody - students, parents, teachers, homeschoolers. Practical Math Shortcuts For Everyday Life from Lifehacker. toddlers claim the song as their own. Alternate Version 1 Audio only, a female chorus sings, accompanied by a big band. into over 100 Themes, 26 Alphabet Areas, & Lesson Plans." relationship between multiplication and division." Kids often wrestle with the concept of fact families. This printable sheet can help. Project Gutenberg "Free eBooks from Project Gutenberg, the first producer of free ebooks. is still the greatest! We like to just browse by Author or Title. own Details Page, Star Ratings, and Reader Comment area." Simply stunning. It's free, go get it! Quizlet "The world learns on Quizlet. We make simple tools that let you study anything, for free." that meet their needs, or they can make their own quizzes and add them to Quizlet's library. Take a quiz, review subjects, spell the vocabulary words, play various games to test knowledge! of the app store." There's a teachers section, too. You can create accounts (free) and keep quizzes there! teachers and students. You can create a quiz and select the range of numbers you'd like to use. some middle school science, and world geography. Thanks to John @ Quizzes.cc for the email! Kindergarten teacher. For pre-K and K-1 learners. Teaches the concept of density. 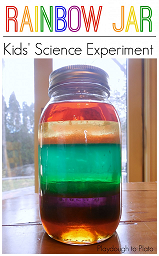 Use common household ingredients to make a rainbow jar. 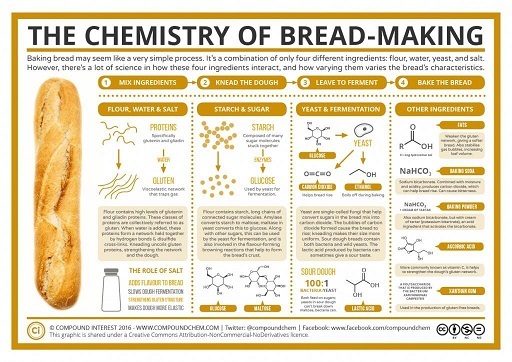 Article includes the materials list, recipe, photos, and lesson plan. on how young kids learn to read, why so many struggle, and how caring adults can help. opportunities; and a robust social community on Twitter, Facebook, Pinterest, and Tumblr." 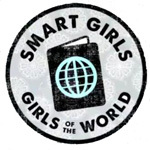 (including booklists and how to choose books), fun things to order, and more. a treasure hunt around the house and yard to find clue cards. Easy to adapt to a classroom. seen it used by others. Saxon has a deserved reputation for good, straightforward 3-R stuff that works. with a fancy edge. Very well done, we thought. free of charge. Find out more by clicking on the cat! the site. We've "field tested" Sebran with 5 - 10 year olds. The games are good, they work. Kids like them, too. Thank you to Marianne Wartoft of Uppsala, Sweden, who wrote this fine software! You can fine various good places to download Sebran, just Google Sebran. Secular Homeschool "Where secular homeschoolers ARE the majority!" kinds of plants, profiles of 200 plants, and info about using copyrighted images. seed saving, and a plant database. We thank the people at The Seed Site for their email! around the globe and we think it would be a perfect fit for your website." It is! matching games, and worksheets. This seems to be the coming thing with these sorts of sites. math and phonics worksheets are auto generated." Spider Web Fine Motor Activity "excellent way to develop fine motor skills" using easily available materials. be used. 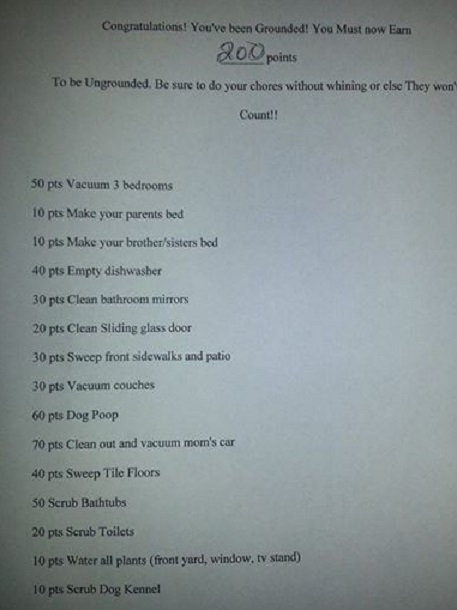 There is a list of easy instructions. StarFall A neat, phonics-intensive site for pre-k through second grade. went to this site with K-2 kids, we found something new and great! In other words, let the kids wiggle. and cartoon Webisodes that help you Take a Stand. Lend a Hand. Stop Bullying Now!" Great material with sections for kids and adults. Student Resources Online from School District 91 - Nechako Lakes, British Columbia, Canada. submit your own. This is a neat find. Thanks to editor Kate for putting this together. and those looking for ideas can save time and leap ahead in competency by learning from veterans. possibilities. It's another fine site brought to our attention via email. Thanks to Mr. Dan McAvinchey. incredibly simple, but seriously effective." sorts of topics. A necessary site for your bookmarks. Interesting site layout, too. prime numbers activity. Better yet, you can rate activities and leave comments - very nice for busy teachers! printable worksheets, 275,000 reviewed sites indexed by professional interest, holidays by month, etc., etc. You need to take the time to look this place over. If you can use a hundredth of this free material, you'll be ahead. Thanks, "Opsmart Matti". the background, and a count of correct/incorrect answers is displayed. This program is freeware. Enjoy." You can change times and the number of questions. register, since the additional features are only useful for teachers. writing practice. " VERY useful site for teachers and homeschoolers. and the videos are quite good. U.S. Presidents Here's a valuable site with amazing amounts of information about all 43 U.S. Presidents! section to find out more about that and the site. While you're there, check out Roosevelt! Thanks to J. W. Smith for the email. have enormous fun whilst building independence on the computer. UpToTen.com is completely independent. UpToTen @ School … With over A THOUSAND educational games and activities for children aged up to ten years old! A safe place to play and learn where your child will feel right at home, right away." "This is a pretty long list but you will find Useful Websites"
A humonguous list of sites that perform various actions to help teachers! Worth bookmarking! Vaccines work. Do not argue. Vaccination is NOT controversial. Get your offspring vaccinated. Read Dr Ginsberg's post. Debating vaccination is like debating gravity - science does not care if you believe it or not! Watch the video. Why are old forgotten diseases such as measles, mumps, rubella, polio, and whooping cough making a comeback? Because too many young parents are not vaccinating their kids, due to hysteria or peer pressure. This makes their innocent children a public health menace. People who don't vaccinate should be forced to do so by court order. Make sure you vaccinate on time, too. Those shot schedules were set by experts. behavior from you! Be a good parent. Be a responsible citizen of your country and the world. Be an adult - get it done. through Algebra 2." Over 2,600, now. Also, Geometry has been added. All are organized by topic. Visual Merriam-Webster Dictionary Online Why go to Google or Wikipedia for all your info? Vocabulary worksheet puzzle makers Free from LessonCorner. either. Nice! The menu is easy to use and you can move back and forth in the process. "Earth's largest dictionary with 90 modern and 10 ancestral languages." 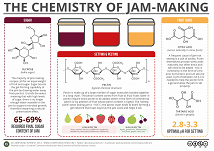 You, too can teach practical kitchen chemistry by making delicious jam! at the science behind jam-making, and how jam sets. homeschooling issues in general, educational thoughts, family issues, and some other random stuff." There's some good reading and discussion points here, also we liked the style. 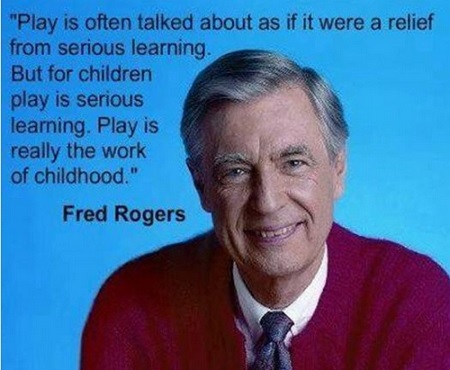 through child-directed and process-oriented projects. We’re so glad you’re here!" Click here to learn more. Oodles of projects in outdoors, art, science, sensory, upcycling, tinkertots, baby, toddler, and school-age. go read over this list, you'll be glad. Zooniverse "We make citizen science websites so that everyone can be part of real research online." can keep track of what you've contributed by watching 'My Zooniverse'."